God’s faithfulness to expand His kingdom through spiritual generations—from one life to the next—is powerfully demonstrated in the story of Andy Nyirenda in Malawi. There is an earlier part to Andy’s story, one that demonstrates God’s promise to impact lives one generation after the next. Andy’s fruitfulness and character are the result of generations of God’s personal investment in many people, including His investment in my own life. 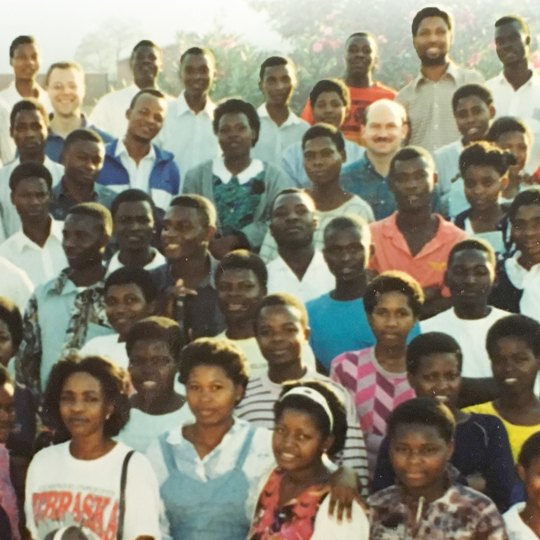 When God led my wife, Susan, and me to pioneer the Navigator work in Malawi, in 1986, we regularly prayed that God would allow us to experience the fulfillment of His promises for spiritual generations in our lifetime. God gave us the privilege of seeing Malawian men and women come to faith and then become disciples and laborers. It was also exciting to watch God form these people into a team with a heart for reaching Malawi. Later, God brought David and Andrea Taylor from the United Kingdom to join the effort. Susan and I spent several years working together in ministry with them. Then we commissioned them to move to Lilongwe, Malawi to reach out to university students. The Taylors also believed that God would produce spiritual generations through their investments in students. That bring us to Andy Nyirenda. He was one of the students who was impacted by the Taylor’s campus ministry in Lilongwe. And now, through Andy and Wezzie, God is laying foundations for more spiritual generations in rural Malawi. Long before we moved to Malawi, The Taylors, Susan and I had already received the spiritual influence of leaders and mentors. Back in my university days (1974-79), when I first became a part of The Navigators, I was inspired by men and women who took the Scriptures seriously and believed that what they read could be true for them! Here are a few of the promises we claimed for the ministry in Malawi, even before we began to work there. "Enlarge the place of your tent, stretch your tent curtains wide, do not hold back; lengthen your cords, strengthen your stakes. For you will spread abroad to the right and to the left; and your descendants will possess nations and they will resettle the desolate cities . . ." (Isaiah 54:2-4). "Look among the nations and watch and be utterly amazed. For I am going to do something in your days that you would not believe, even if you were told. . . . Though it lingers wait for it; it will certainly come and will not delay" (Habakkuk 1:5; 2:3). "Ask of me and I will give you the nations and the very ends of the earth as your inheritance" (Psalm 2:8). Clearly, all the people who invested in us have had a generational impact leading all the way to rural Malawi. And there is no way to measure what Andy’s influence on people will have in the future. This generational story about Andy is common in the Navigator work. It’s happening all over the world. Since the 1930s, God’s promises have fueled the faith of countless Navigator men and women who have believed Him for the power to live out a fruitful and supernatural life in a disintegrating world. This faith in God’s promises to produce spiritual generations continues to be one of the hallmarks of those who call themselves Navigators. David R. (full name omitted for security) is the Navigator Regional Director for Eurasia. He and his wife, Susan, started the Navigator work in Malawi in 1986. David joined The Navigators during his university years, in 1974-1979.